I have replaced “simple syrup” with maple syrup and increased the rum portion, as well as “Persianizing” the brewing process; as a result my cocktail has a deeper flavor and thicker body and is still a bit tart and sour-sweet with amazingly refreshing effects! 3 tbsp. dry hibiscus tea (known in Persian as “sour tea”) to get 4 cups of brewed tea (see instruction below). 2 cup aged rum such as Flor de Caña. Variation: If you don’t have maple syrup handy, go with the same amount of simple syrup. To make simple syrup, mix 1 cup water with 1 cup sugar in a small saucepan and heat over medium heat, stirring constantly, until sugar is dissolved and syrup is thickened. Cool before using. Measure out 3 tablespoons hibiscus tea. Bring 4 cups of water to a boil, ideally in a kettle. Once boiled, add water to the hibiscus tea in a teapot. Place the kettle on a low heat, and put the teapot right on top of the kettle. Let it sit there for at least ten minutes. If you are not equipped to do so, after adding hot water to the teapot, simply keep the teapot close to the direct source of heat for ten minutes. This brewing technique brings out the most out of any kind of tea I promise you! Remove from the heat and let it cool. Pass the tea through a fine mesh strainer in to a big bowl. Add lemon juice, maple syrup and rum. Stir gently to mix. Place mint leaves in bottom of a pitcher. Add the contents of the bowl (cooled hibiscus tea, rum, maple syrup and lemon juice) to pitcher. Add 1 cup ice, stir and cover. 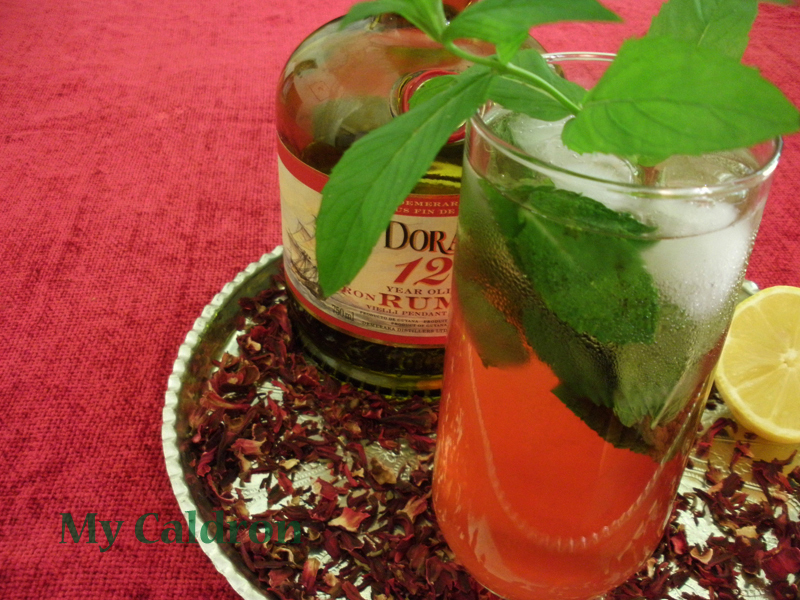 Prepare your serving glasses by placing a few mint leaves in the bottom of each and filing them with ice. Add club soda to the pitcher before pouring the drink into your glasses. Place at least one mint string in each glass for added visual and sensory delight!